Two researchers at the University of Sydney, Jacqueline Marshall and Scott Byrne, have just published a paper in Photochemical & Photobiological Sciences with the same provocative title as this blog. 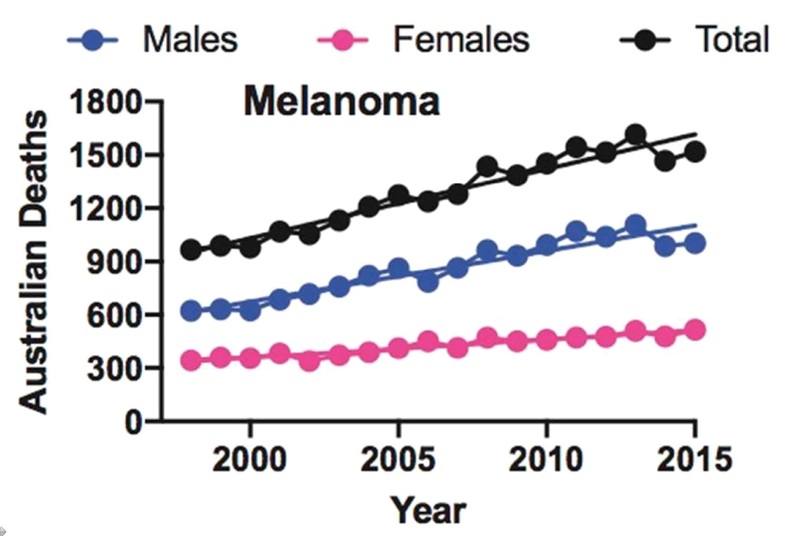 They stated, “Living on a sun-drenched planet has traditionally required adaptation to and protection from the harmful effects of solar ultraviolet (UV) radiation.” As they showed, mortality from skin cancers like melanoma continues to rise in Australia (see image below left, © Royal Chemical Society). While there is no doubt that sunlight is the primary cause of skin cancer via mutagenesis and immunosuppression, evidence is mounting that the sun may actually provide protection against some internal malignancies. 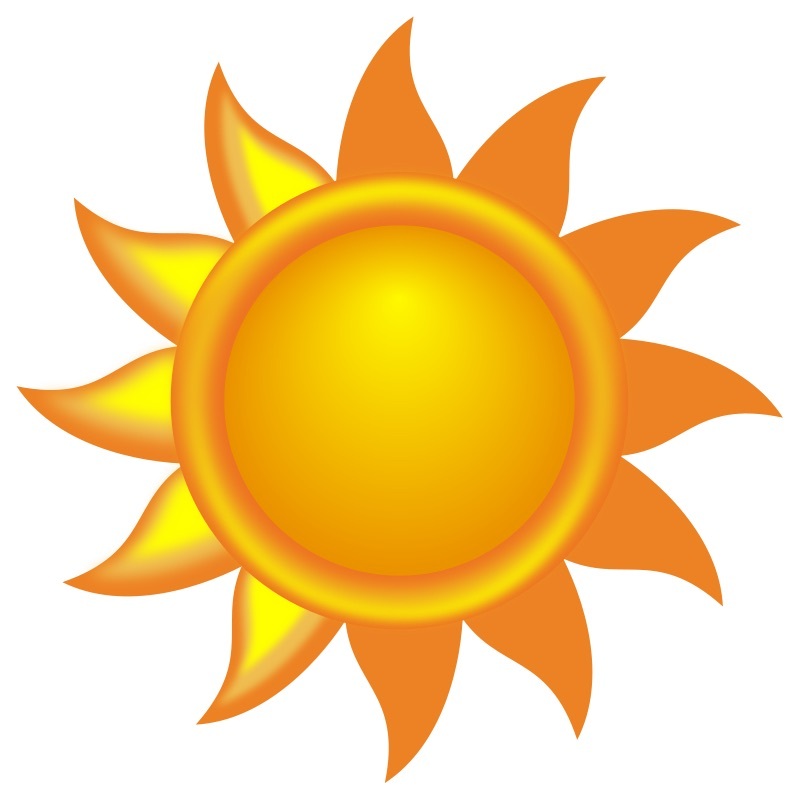 The evidence that exposure to sunlight correlates with a reduced risk of internal malignancies started to emerge in the 1980s. In 2008, researchers from San Diego published an article in The Breast Journal entitled “Relationship between low ultraviolet B irradiance and high breast cancer risk in 107 countries.” Their findings have been summarised in the figure below right (© Blackwell). What they showed is that breast cancer incidence is inversely related to geographically-dependent exposure to cutaneous sunlight. Women living in countries close to the equator – such as Angola (ANG), the Democratic Republic of Congo (DRC), Venezuela (VEN), Somalia (SOM) and Egypt (EGY) – tended to have a low incidence. 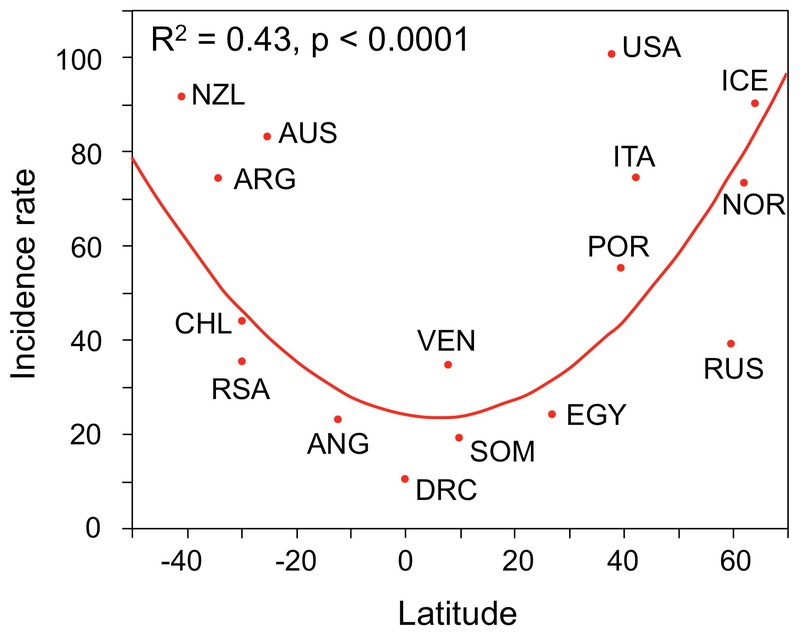 In countries further south – such as Argentina (ARG), Australia (AUS) and New Zealand (NZL) – or north of the equator – such as Italy (ITA), Iceland (ICE) and the USA – the incidence rate of breast cancer was much higher. The evidence suggests that UV radiation provides some protection against breast cancer but the mechanism remains unclear. Marshall and Byrne concluded that clinical trials using Vitamin D supplementation to treat patients with tumours has been disappointing, which “has given weight to the argument that there must be something else about sunlight that explains its cancer-protecting properties.” The search continues.